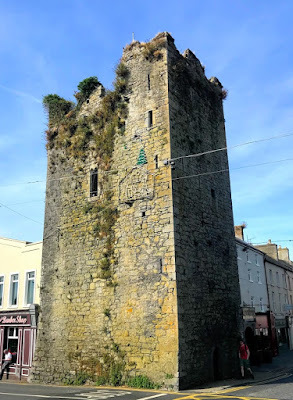 During my visit to Thurles earlier this week [25 July 2018], I went looking for the castle in Thurles that was home for over six decades to Elizabeth Butler, Dowager Lady Thurles, and one of the leading women to engage in politics in Ireland in the 17th century. Elizabeth Poyntz (1587-1673) was a daughter of Sir John Poyntz of Iron Acton in Gloucestershire. 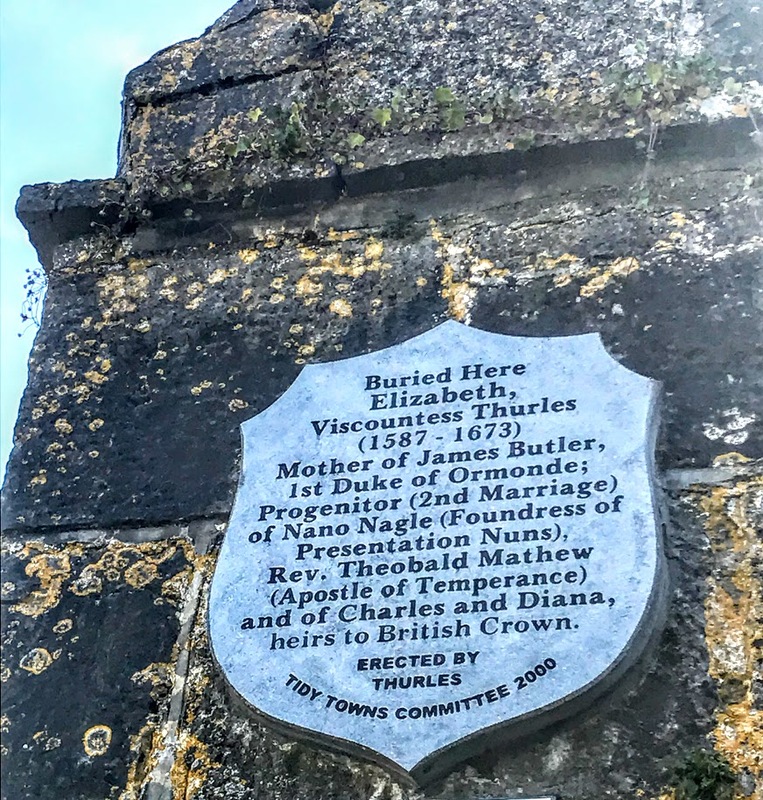 She became Lady Thurles in 1608 when she married Thomas Butler (1586-1619), Viscount Thurles, son and heir of Walter Butler (1559-1632), 11th Earl of Ormond. Apparently, her father-in-law opposed the marriage, perhaps because her father was notoriously debt ridden, and he would die penniless. Some sources say Elizabeth lived in Thurles Castle for 65 years, from the time she married in 1608 until she died in 1673, apart for a short period at the end of the Cromwellian era (1658-1660). Thomas and Elizabeth Butler, Lord and Lady Thurles, were the parents of sons and four daughters before he drowned on 15 December 1619, His father, the Earl of Ormond, was beginning a long prison sentence in the Fleet Prison in London, and Thomas was on his way to answer charges of treason for having garrisoned Kilkenny, when the ship taking him to England was wrecked off the Skerries. The widowed Lady Thurles married again, about 1620. Her second husband was Captain George Mathew of Radyr and Llandaff in Glamorganshire, Wales, and they had two more sons and one more daughter. George Mathew died at Tenby in Wales in 1636. His widow continued to call herself Lady Thurles and lived for a further 37 years. When she died in Thurles in May 1673, she was buried in Saint Mary’s Church of Ireland parish church. But which castle in Thurles was the life-long home of Lady Thurles, and how did she manage to return there in 1660? Samuel Lewis wrote 200 years ago that during the parliamentary war in the mid-17th century, Thurles Castle was garrisoned by the supporters of King Charles I. It was later taken by the parliamentarian forces, who demolished the castle. Did Lady Thurles return to a newer building at the site of a castle that may also have been called Thurles Castle? The historians Francis Grose (1791) and Ella Armitage (1912) imply a building called Thurles Castle was still standing in their lifetimes. So, which castle did Lady Thurles live in? Bridge Castle, overlooking the River Suir, dominated the Thurles skyline from 1453, when it was built by James Butler, 4th Earl or Ormond, who built two castles at Thurles that year. This castle is a mediaeval tower house, similar to many castles of this type built across Ireland in the mid-15th century, and a small fragment of the east gate of the town wall is still attached to the north wall of the castle. The castle was built to control the river crossing at the River Suir, to collect tolls and if necessary to defend the river crossing against attacks. Bridge Castle is a small three-storey tower with a vault over the first floor. The original doorway may have been set in the west wall and a spiral stairway rises in the north-west corner, giving access to all the upper floors. A small fragment of the original east facing arched gateway of the walled town protrudes today and is still attached to the north wall of the castle. Small garrisons of armed soldiers were housed in these buildings, and the small, pointed arch doorway on the north wall may have provided the small garrison immediate access from the tower to the river crossing. The castle lost its strategic significance when Barry’s Bridge, beside the castle, was first built ca 1650, and the bridge has since been rebuilt ca 1820. The Down Survey (1655-1656), carried out by Sir William Petty, lists James Butler, (1610-1688), Earl of Ormond and future Duke of Ormonde, and his mother Elizabeth Butler (1615-1685), Dowager Lady Thurles, as the proprietors of Bridge Castle. So, perhaps, Lady Thurles returned after the Cromwellian era to live at Bridge Castle in Thurles, while her son James Butler, who had succeeded as Earl of Ormond and later became Duke of Ormonde, returned to live in Kilkenny Castle. Ormonde was a first cousin once removed of Grany Kavanagh who married John Comerford of Ballybur Castle, Co Kilkenny, and Edward Comerford was a witness to his marriage settlement when James Butler married Lady Elizabeth Preston in 1629. After the restoration of the monarchy in 1660, Lady Thurles wrote to her son in 1661, recommending Edward Comerford’s son, Thomas Comerford, for service and for the restoration of his father’s confiscated lands. Ormonde was also a half-brother of Toby Mathew of Thurles and Annfield. Ormonde gave Toby Mathew the manor, castle and town of Thurles and a vast estate. A century later, the Bridge Castle was lit up, along with the bridge and the market house, in celebration when Toby Mathew’s descendant, Frances Mathew (1738-1806), was elected MP for Co Tipperary. Francis Mathew later received the titles of Baron Llandaff (1783), Viscount Llandaff (1793) and Earl of Llandaff (1797) was elected Tipperary Member of Parliament, a position he held from 1768 to 1783. Francis Mathew lived at Thomastown Castle, Co Tipperary, where the temperance campaigner Father Theobald Mathew was born in 1790. Thomastown Castle fell into ruin by the late 19th century. Apart from the external walls, none of the original fabric remains, the castle is suffering from structural problems that could lead to full or partial collapse, and there is an immediate threat of further deterioration. But Thomastown Castle is half-way between Cashel and Tipperary Town, and so could not be the Thurles Castle where Lady Thurles lived for most of her life. However, there is one other castle in Thurles that claims to be her former residence. The Black Castle, which was sold on the open market last year  along with a commercial building that links it directly to Liberty Square, the main square in Thurles. When the Black Castle was put on the market by Kenny family, the vendors claimed the castle had been the home of Elizabeth Poyntz and her husband Thomas Butler, Viscount Thurles, in the 17th century. The Black Castle is a 15th-to-16th century tower house built beside another castle and motte. The present remains include a four-storey tower house with a parapet built with roughly coursed limestone rubble and with a pronounced base-batter. There is a barrel vault over the ground floor, a pointed vault over the second floor and wooden floors elsewhere. The original entrance, which is now blocked, was in the south end of the east wall with two other entrances inserted at a later date. The main entrance gave access to two lobbies protected by overhead murder-holes and a cruciform gun loop. The walls and floor at ground-floor level have been concreted and a plastic barrel-shaped panel roof inserted to accommodate its last function as an abattoir. There are mural stairs in the west and north walls that give access to the upper floors. The windows at first-floor level have been blocked up or modified. Very little is left of the parapet wall, but a portion of it survives on the south and west sides with evidence of a bartizan at the south angle, and there are remains of spouts at the base of the parapet wall. Substantial corbels projecting out of the west face, three above the first and the same above the second-floor level. Only fragmentary remains of the bawn survive, the north wall of which was levelled in recent years. A 17th century house may have been built against the west face of the tower house but has not survived. 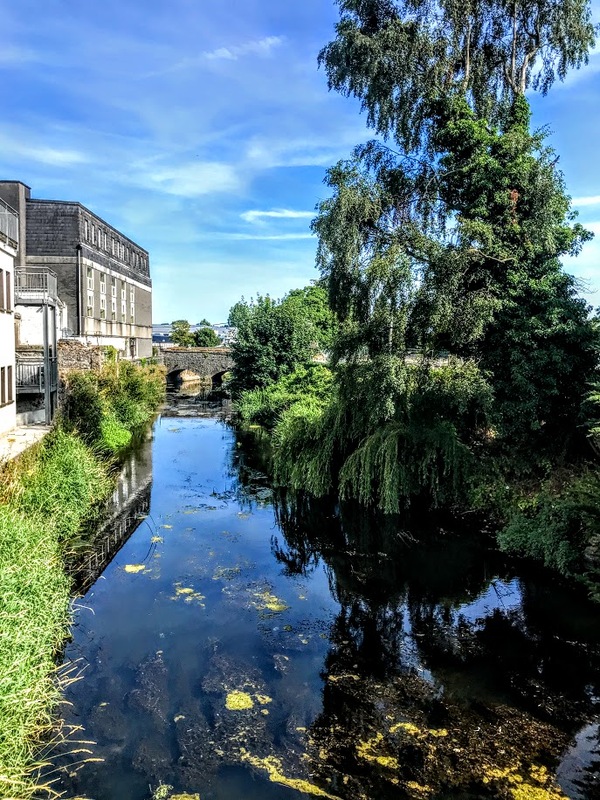 But if this was the site of the Thurles Castle that was home to Lady Thurles in the 17th century, it would explain the names of Castle Lane, Castle Park and Moate Lane nearby, as well as Castle Meadows a little further away. The former Black Castle, west of Liberty Square, was bought by a local financier and business figure, Timothy Maher, who said at the time he is budgeting to spend €2 million to restore the castle. There is no direct access to this castle site, so I did not get to see the Black Castle during my visit to Thurles earlier this week. But I plan to return and it promises to be interesting to see how the new owners develop the castle.